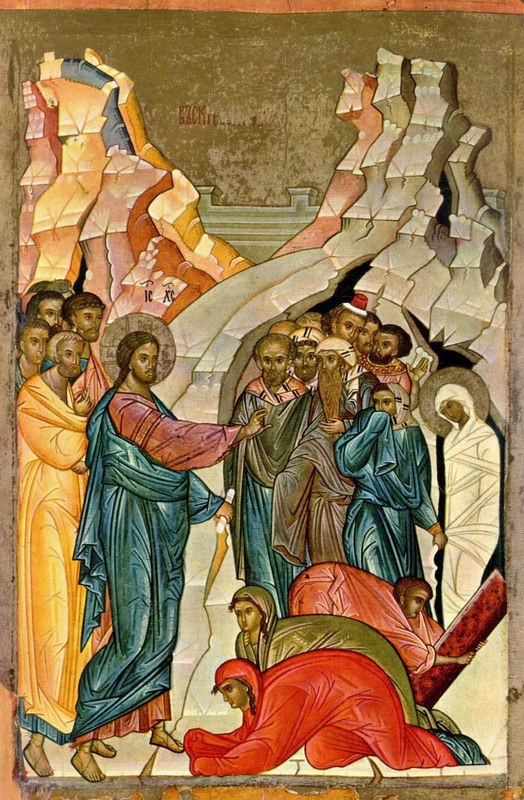 Today is Lazarus Saturday, when we commemorate, just before Palm Sunday, the last Sunday before Pascha (Easter), the resurrection of St. Lazarus from the dead by Jesus Christ. The Gospel of John reports that this drew so much attention to Jesus that it served as a major impetus for those who opposed him to plot his death: “Then, from that day on, they plotted to put him to death” (John 11:53). But death, as the story of the raising of Lazarus shows us, was not something Jesus intended to avoid. I would love to carefully exegete this whole passage, but I will content myself with a few observations. St. John tells us that, “when he [Jesus] heard that he [Lazarus] was sick, he stayed two more days in the place where he was” (John 11:6). This is just after Jesus told his disciples, “This sickness is not unto death, but for the glory of God, that the Son of God may be glorified through it” (John 11:4). Yet, Jesus takes his time and Lazarus, in fact, dies. “Our friend Lazarus sleeps,” he says, “but I go that I may wake him up” (John 11:11). When his disciples misunderstand, thinking he literally meant that Lazarus was sleeping, Jesus tells them bluntly, “Lazarus is dead. And I am glad for your sakes that I was not there, that you may believe. Nevertheless let us go to him” (John 11:14-15). The disciples were worried already that people were seeking Jesus’s life. They did not think it was a good idea to go back to Judea. As is often the case, one of his disciples, St. Thomas, responds in a way wiser than he himself intended or knew: “Let us also go, that we may die with him” (John 11:16). I hate to skip it, but I will pass by Jesus’s encounter with Martha and the demonstration of her faith. I will only note Jesus’s key “I am” statement: “I am the resurrection and the life. He who believes in Me, though he may die, he shall live. And whoever lives and believes in me shall never die” (John 11:25-26). Here the concepts of death and life are being transformed by the one who is “the resurrection” and the true life. This is what I want to focus on. On the one hand, Anaxagorus has a point that we ought not to live ignoring the reality of death. On the other hand, we ought not to ignore that it is tragic. Jesus does not fall into either error. Grief at death is good, for we ought to grieve what is truly evil. Jesus groans, however, because he also wants us to have hope. He weeps for death but groans at despair. “Come and see.”—St. John begins his Gospel with two stories that feature this same phrase. In the first, some disciples of St. John the Baptist decide to follow Jesus and ask him, “Rabbi … where are you staying?” To which Jesus responds, “Come and see.” (John 1:38-39) “Where have you laid him?” “Where are you staying?” “Come and see.” Most important about this is not so much where Jesus was actually staying but rather that he invited these disciples to follow after him, to become his disciples. Thus, in the story of Lazarus, St. John the Evangelist wants his readers to think back to the beginning, to think again about what it means to follow Jesus. He already hinted at it earlier with the words of St. Thomas above. In the second story, St. Philip, one of these disciples, finds his brother St. Nathaniel and tells him, “We have found Him of whom Moses in the law, and also the prophets, wrote—Jesus of Nazareth, the son of Joseph.” Nazareth was a town on the outskirts of Israel, only known for one prophet, Jonah, who famously ran from the call of God and only bitterly obeyed him. In disbelief, Nathaniel asks, “Can anything good come from Nazareth?” To which Philip responds, “Come and see.” Philip now gains a follower, but not for his own glory; rather it is in order to bring him to Jesus, the fulfillment of all their hopes. “Then the Jews said, ‘See how he loved him!’ And some of them said, ‘Could not this man, who opened the eyes of the blind, also have kept this man from dying? '” This is a good question, for all times and places and people. The answer in this passage is not that Jesus couldn’t have kept Lazarus from dying. Rather, his call to us, “Come and see,” requires total self-abandonment. He does not come to prevent us from dying, because dying is now an essential part of the process of our spiritual development. Rather, he comes to do for us what we cannot do ourselves: to raise us from the dead. He does not prevent us from dying—in a million small ways all of our lives and at the end through the deaths of our bodies themselves—but he does promise resurrection. Indeed, baptism itself, the beginning of the Christian life, is a participation in Christ’s death: “do you not know,” writes St. Paul, “that as many of us as were baptized into Christ Jesus were baptized into His death?” (Romans 6:3) He then exhorts his readers, “just as Christ was raised from the dead by the glory of the Father, even so we also should walk in newness of life” (Romans 6:4). Dying and rising is what we signed up for, whether we knew it or not at the time. We cannot cheat death, nor any of the little deaths of our soul that we face all throughout our lives. But just because we can’t cheat, doesn’t mean we can’t win. And Christ will give you light. “By means of Lazarus has Christ already plundered you, O death.” Holy Week has just begun, but Pascha is just around the corner. Death is the final, tragic word of evil and impermanence, but evil and impermanence will not have the final word. Let us, too, rise from the dead daily, and Christ will give us light.